The University of Montana released the instructional budget for its academic departments on Thursday, setting targeted goals for 2021 as it looks to right-size the institution to match current enrollment and student needs. 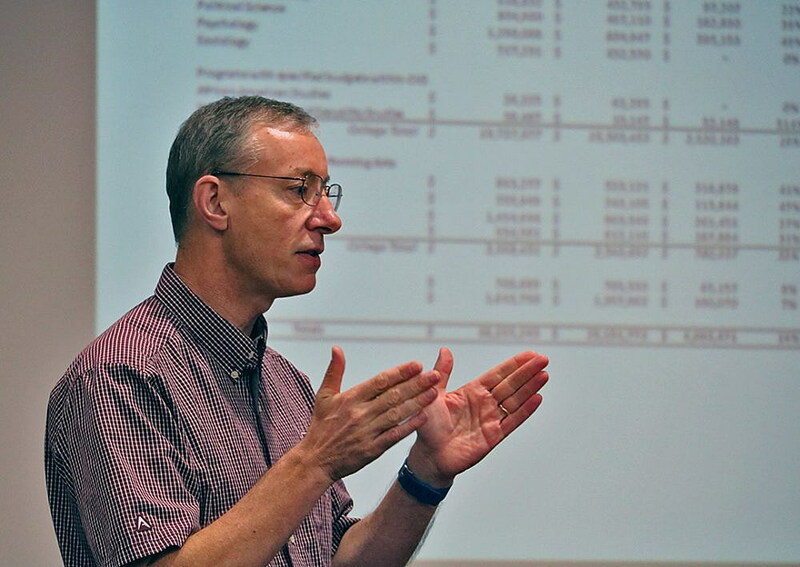 UM Provost Jon Harbor said the figures, which reflect a $5 million reduction in the academic instructional budget by 2021, resulted from strategic recommendations offered by faculty, staff and student leaders over the past year. Harbor joined other university officials in walking local media through the instructional budget targets for 2021, describing the complex formulas used to achieve the figures. Using the five-year period from 2009 to 2013 as a benchmark, the effort calculated the average student credit hour to faculty ratio for each department. That ratio was applied against 2018 enrollment data to determine the staffing budget needed to achieve the current student-to-faculty ratio. That resulted in what Harbor described as the presumptive instructional budget. Those strategic investments were driven by data collected through campus input and academic recommendations. Harbor took those recommendations to UM President Seth Bodnar for final approval. The resulting targets were influenced by a wide range of priorities, including programs with a large and growing number of majors and those that show strong recruitment potential. Other factors, such as artistic expression and areas of excellence, were also included. Other programs will also see strategic investment, including anthropology, communications, Native American studies, psychology and biology. Despite recent campus rumblings, art, music and dance also made the list. At the same time, several under-performing programs are slated for cuts, including global humanities and religion, which will be phased out over the next three years due to its low number of majors. Modern and classical languages will also see a budget reduction, which Harbor said is consistent with recommendations made in the spring. The plan presented Thursday didn’t detail staffing targets, which the school aims to achieve in June 2021, thus impacting the Fiscal Year 2022 budget. Some of those staffing targets will be achieved through attrition. Over the next month, departments will work to develop their staffing plans. Broken down by college and school, business will see a 3 percent reduction by 2021, though its budget will stand at $3.3 million. Education will see a 1 percent decrease and a $2.9 million budget. The university’s largest college – humanities and sciences – will see a 20 percent reduction, though its budget will stand at $15.8 million. As enrollment rebounds in future years, Harbor said, further adjustments will be made to reflect the growth. “At the same time we’re making sure our budgets are matched to our current resources and student interests, our teams at UM are also working very hard to increase the number of students who are choosing UM for its outstanding academic programs, amazing student experiences and transformation impacts,” Harbor said.